The first class I rationalized ditching in high school was U.S. History. Ok, fine, it was the second. I didn’t go to P.E. either. But it seemed that I had set a precedent, because I skipped so many of my Ancient Greek History classes at U of I my freshman year, as well. It was just something about what we learning: It seemed wholly irrelevant, despite my teachers’ valiant (or not so valiant) efforts to make it relevant. I didn’t care. At all. We’d have the time-old discussion about why we learn history. It seemed that the phrase, “We learn about our history, so that we don’t repeat our past,” or some nuance of the phrase became so commonplace in the classroom that it became cliche. I mean really, if the topic was engaging in the first place, would teachers feel the need to campaign and give reasons for learning their content? (1) Stop with the cliches and the gimmicks. Sure, it’s good to let kids know why they’re learning what they’re learning, but the relevance of the topic should not, by any means, hinge upon some cliche phrase. Instead, the texts that kids read, the activities in which they participate, and the lessons they learn need to be engaging and relevant, in order for children of all ages to naturally pick up on that relevance. It’s like anything else–we, as teachers, can only do so much. We can dance around and tire ourselves out trying to make something relevant, but at the end of the day, the children have to buy into it. We can’t make them. 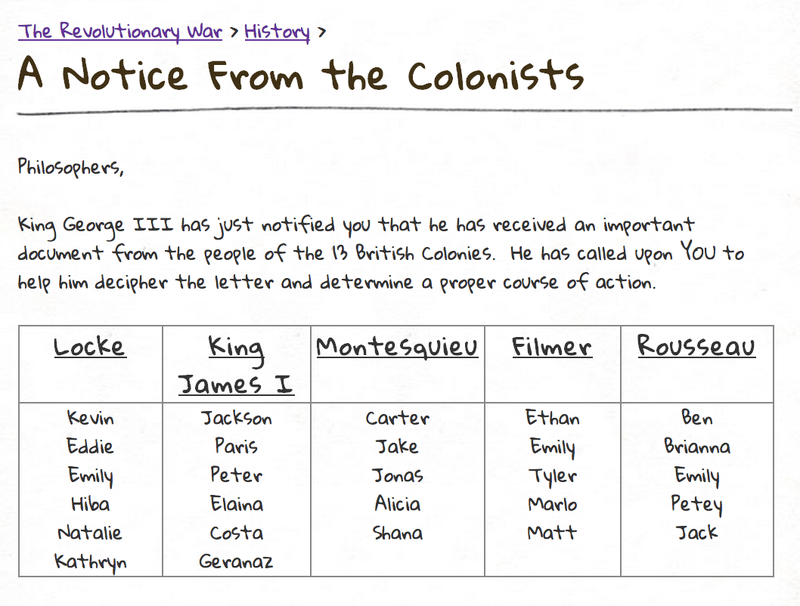 Instead of the gimmicks, I argue that we should change our approach to history instruction, especially in the lower grades. If they begin to make meaningful connections to historical events at a young age, it will, most likely, spark their interest in the topic and propel them forward in their social studies and history education. But how do we do that? How do we find the importance in these units of instruction that seem so irrelevant and far-removed from our children? Children are, undoubtedly, social beings. There are entire educational theories that support the idea–no, the need–for children to be social in order to be able to grow and develop, and if you think about it, social studies is one of the best places to cultivate that. Most topics that children study in the elementary grades have to do with the history of the United States and how people interact. So, I would argue that if you find the social component to what you are teaching, capitalize on it, and let the kids LIVE it, you will have created a relevant social studies unit. (3) Turn it into a story. Really, history is simply a series of stories–many of which tell similar ideas. It can be compared, very nicely, to fiction. In fiction, the characters, the plot lines, the settings–none of these things, when taken purely literally or in isolation, are important. Instead, a story–or a bit of history–becomes relevant due these story elements that fuse together to communicate a universal message or a theme. It helps us to answer a question about life, or a question that we were wondering about ourselves. And that is how history should be, too. If you’ve been reading, you’ll know that I’m in the midst of a unit on values. We are examining our own values, the values of others, and how these values affect our decision-making through the lens of the Revolutionary War. One could argue that this is this “theme”–values–is the one that I am currently studying with my kids. Today, my students did a close reading of the Declaration of Independence. Granted, it was an abridged version, but the kids were able to get so much out of it, because I made it relevant through the study of personal values. This week, the kids began by examining their own perspectives on government. I asked them what they viewed its purpose to be and if they thought government was a good thing to have. After discussing authority the week before, it was a relatively easy conversation for them to begin independently. After building a base for their own beliefs on government, we were able to closely examine the values and beliefs of prominent philosophers, as well as some other important figures that influenced ideas on government. 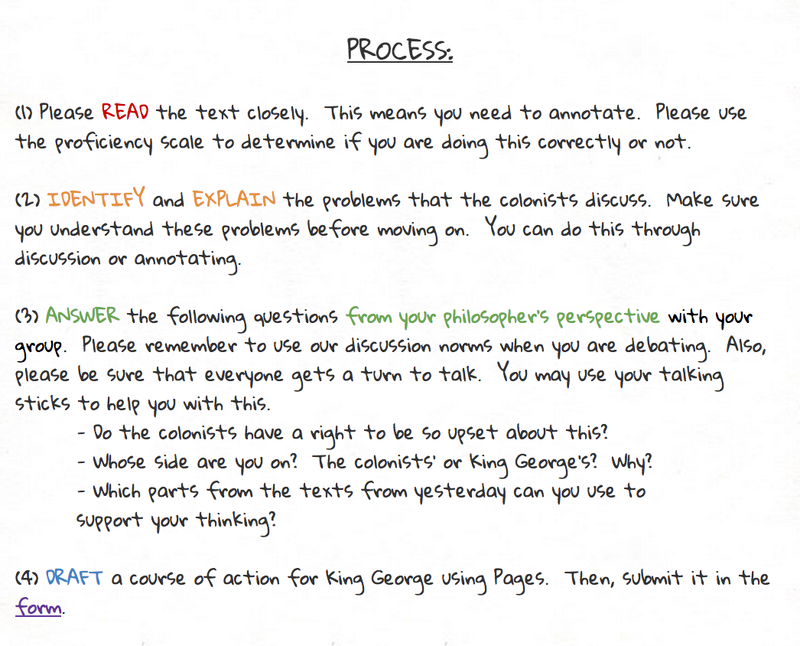 They read excerpts from their writings and used them for today’s discussion, where they were required to do a close reading of the Declaration of Independence (an unedited, but abridged version) and take the perspective of their philosopher to determine whether or not they supported the colonists’ decision to secede from Great Britain (see process below). By helping the students develop empathy and assisting them in stepping into someone else’s shoes, the children were instantly more engaged in the content, and it immediately became more relevant. (5) Piss the kids off a little bit. If there’s one way to keep kids in engaged, it’s by getting them angry. I decided the essential question for this unit would be, “What is the point when someone decides it’s time to make a change?” Instead of looking at only the American Revolution, I wanted kids to be able to see this in many contexts, even those that are not historical. With this essential question, they could even think about it within the context of their own lives. And most relevant points in history have to do with change, if you think about it. People, as well as the societies in which they live, are dynamic and constantly changing. Understanding the catalysts that help to make that change will be foundational to students understanding a great deal of historical periods. And so how do I show the kids this idea? How do I get them so pissed off so that they’ll start to cause a ruckus? I give them money, naturally, and then I take it away. In order to simulate King George’s erroneous taxes (depending from which side you’re looking), I created the “Penny Game,” where students are given a bag of pennies to hang on to. The rules of the game state that the child who ends up with the most pennies at the end of the week would win and get to bring their pennies home with them. However, as the week progresses, I start to “tax” them for various items, such as the use of their iPads, Post-It notes, or even one-on-one or small-group time with me. Some students are outraged by this, while others go along with this, depending on the privileges I give them. It’s the perfect social experiment, where both compliance and subversion come into play. It just can’t. It’s too important, and not so that we don’t repeat our past mistakes; instead, history shouldn’t be boring because it teaches us so much about who we are the universal things that we all experience, no matter our age, label, or time period. History helps us to build empathy, and it helps us to understand each other. So get out of the textbook, and start helping kids experience history first-hand!